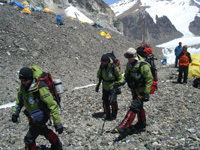 Part of the expedition gear is specifically modified for the needs of the expedition. Other gear has gone through a thorough evaluation of the quality and functionality. To make it simple, the all gear are the best what current technology can provide. When choosing the gear the main criteria are the weight (lightness) and reliability. The final decision on the chosen gear is the compromise of these two criterias. The daily work on the mountain is either hot or cold work. It depends on the weather conditions and the altitude. The most important factor when choosing the clothing has been the tested performance in the extreme conditions. The outfit must adapt from the heat of the lower camps to the strong winds and coldness of the higher camps. The clothing will be based on layers according to the weather. Important characteristics of the gear are lightness, breathability, wind resistance and warmth. On the mountain we need to find a safe and warm place to cover from a storm. In the lower camps the expedition will stay in roomy base camp tents where we can rest and recover from the work and acclimatization up in the mountain. The tents in the higher camps are exposed to the furious winds. Therefore they are selected with special care. The criteria has been strenth, lightness and ease of use. Good nights sleep is ensured by light and warm down sleeping bags. Above the base camp the climbers wil prepare their daily meals by their own stoves. Melting the snow and preparing the food is pretty time consuming work. The performance of the stoves and ease of use in the most difficult conditions is the basic criteria when choosing the stoves. the expedition will use gas which works well in the cold weather. When moving in a glacier and mountain the climber always wears a harness, crampons and has an ice axe. This way a safety is ensured when moving in a demanding terrain and weather. When crossing an area with crevasses and otherwise challenging terrain the expedition will always use a rope. To be able to convey the information of the progress to Finland the expedition will have the state of the art communication gear in use.